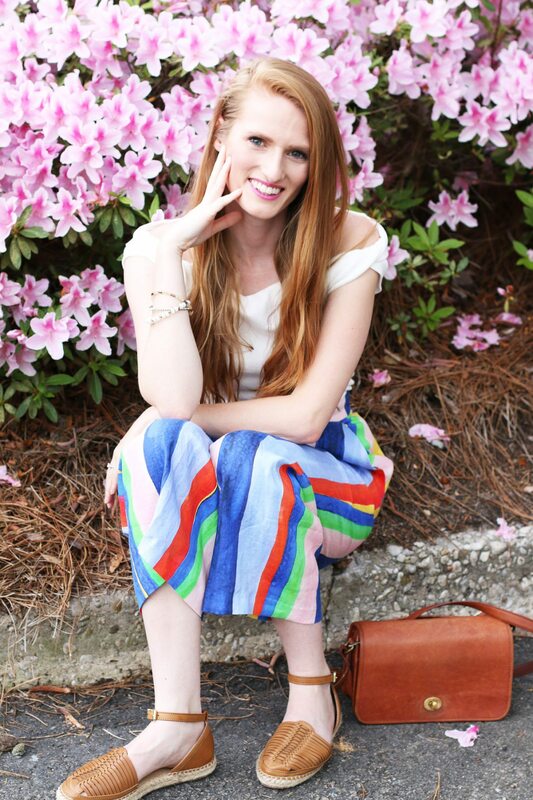 When I first saw these Mara Hoffman colorful pants, I couldn’t resist getting them! They make the perfect beach getaway look, and although I have no plans of going anywhere tropical any time soon, I styled them with the pastel yellow backdrops of Southern Pines, NC to showcase their colorful style. 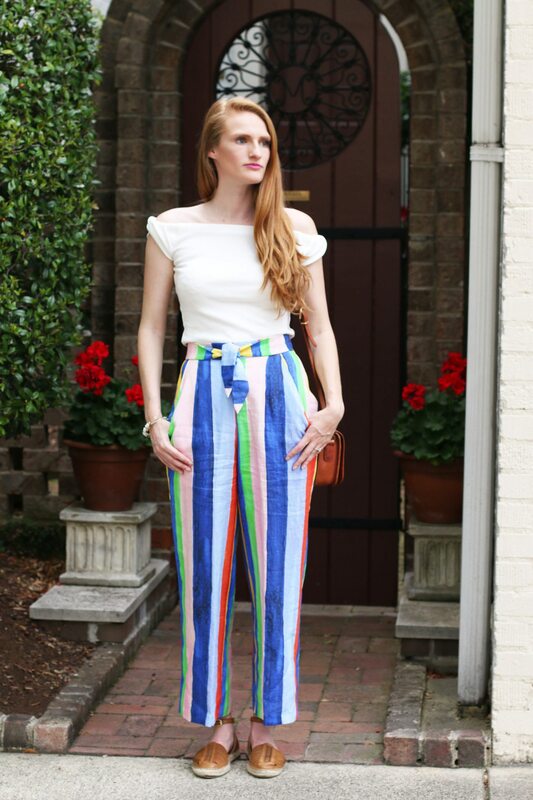 I really think these pants scream “resort,” they are boho, but still maintain a chic and stylish aspect about them. If I could I’d rock these on the beaches of Jamaica or against the colorful backdrops of San Juan, Puerto Rico. Just looking at these pants make me feel warm sunshine inside! 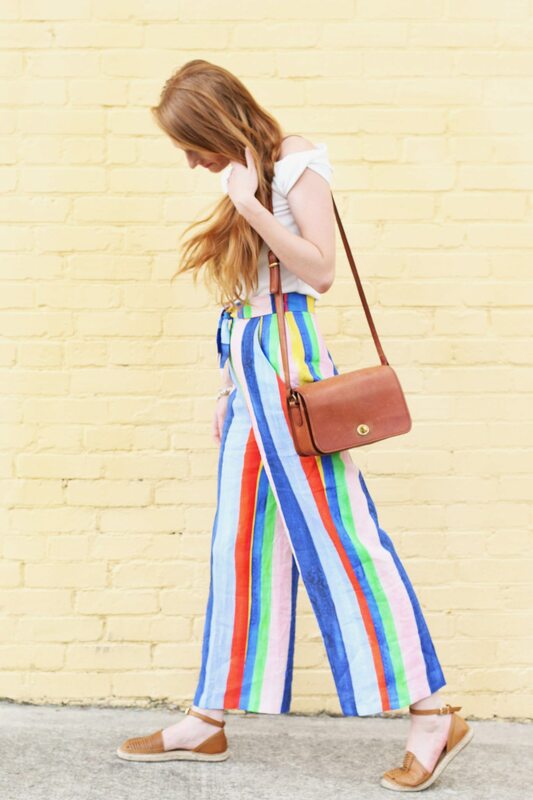 I styled these rainbow pants with some casual brown espadrilles and my vintage leather coach bag. They add to the easy, breezy aesthetic of the pants. I wore my OTS top from Storets, but any white tank top or top will work too. While I’m over here dreaming of a destination vacation, I hope you enjoy these pictures and have a great weekend! Shop my entire look at the bottom of this post! Tell me in the comments below – if you could travel any where in the world with these pants, where would you go? omg in love with this color pop! this entire look is adorable, i really love those pants they have so much energy! mara hoffman is always so fun. i think every girl needs these pants in their life! Rainbow is the best and is definitely a color! Love your outfit! These pants are so fun, and I love them with the off shoulder top! There are too many places that I’d love to wear these pants to name! 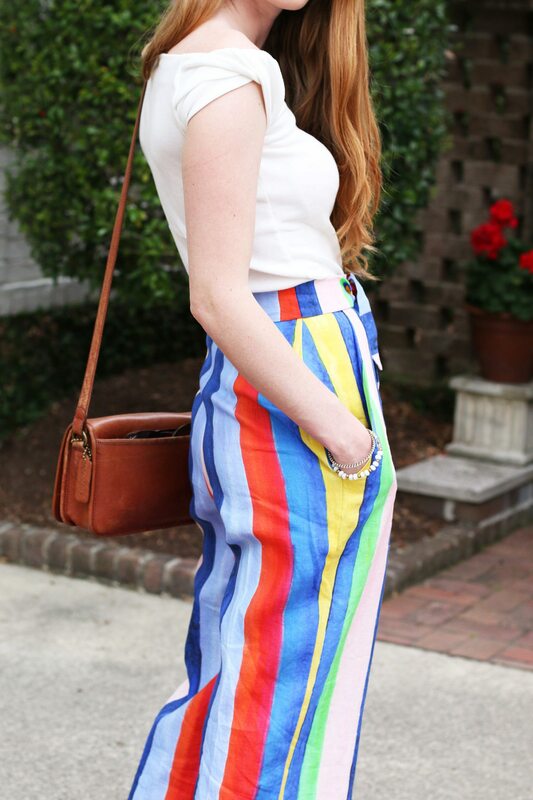 That rainbow print is perfect! I love those pants. 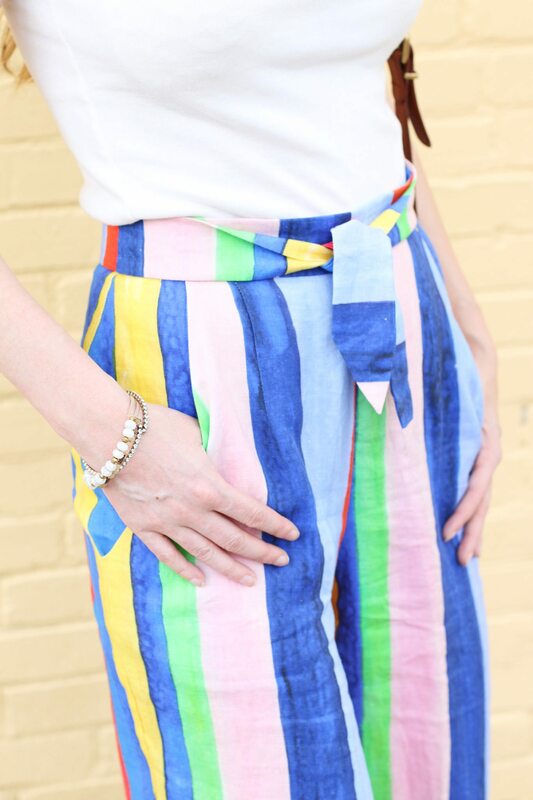 These pants definitely exude beach vibes! Now I will be dreaming of a beach vacay.. 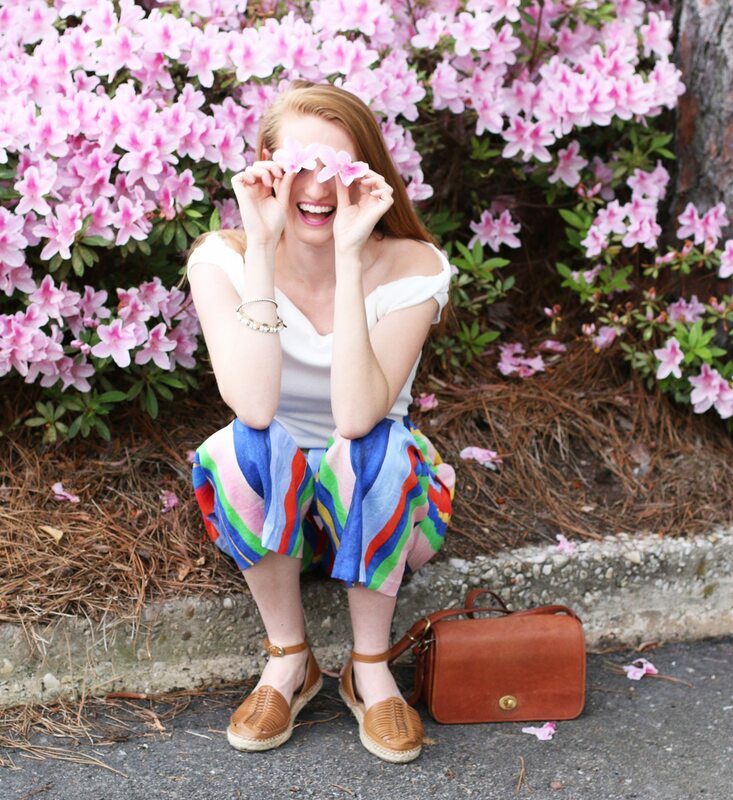 Such a fun colorful look – and those espadrilles are perfect! 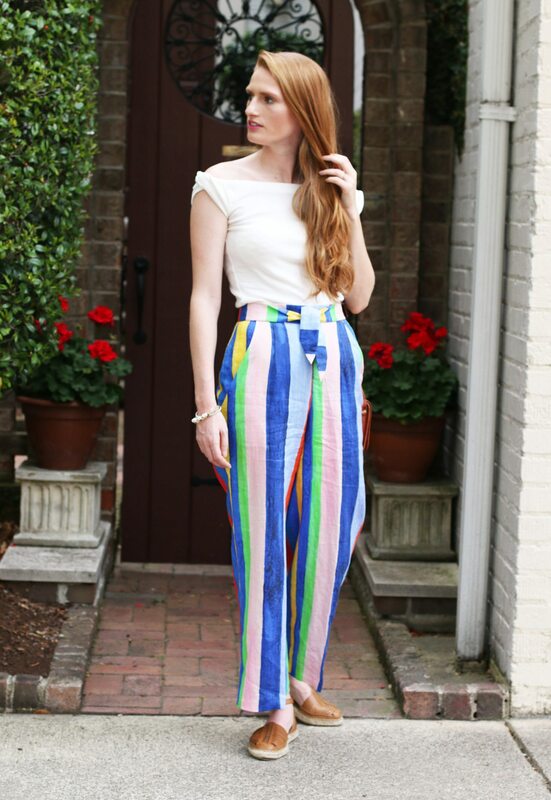 Those are some seriously fun pants! Definitely made for a weekend full of dancing and having a great time! 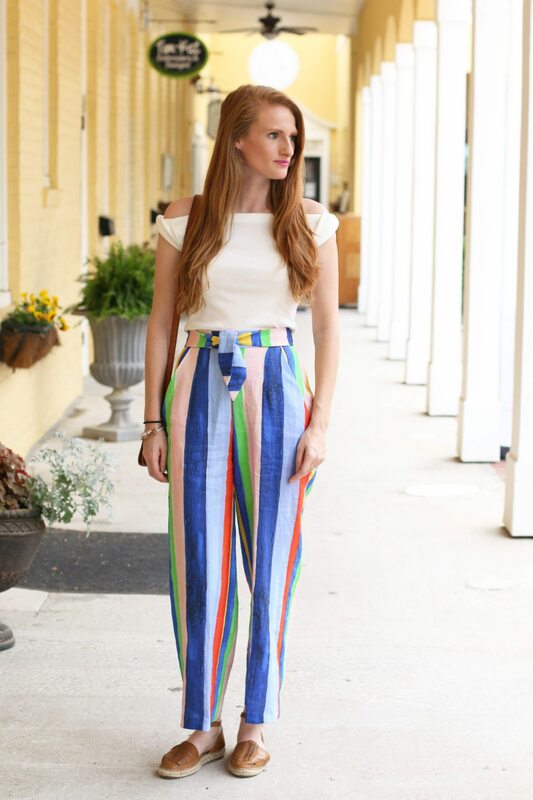 These pants are perfect for a summer vacay! OMG these would be absolutely perfect on beach vacation! I love how you’ve styled them here. 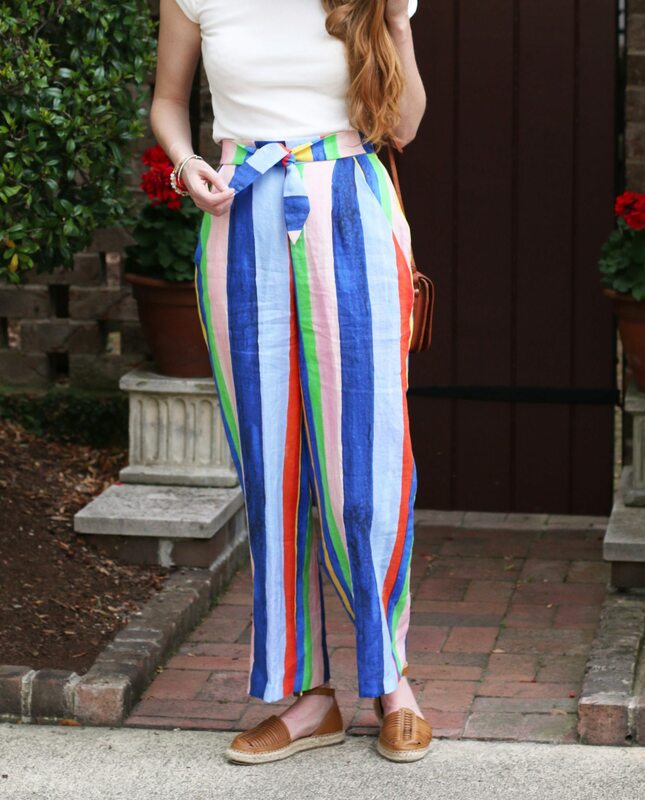 These pants are too perfect for spring! You look fabulous in them! not many people could pull off these pants, but you are totally rocking them!! They look like they were made for you! Those pants are everything!!! You look so lovely! OMG love them! You look like such a colorful person full of life! Oh my gosh I need to get these pants ASAP! I seriously love them! And your white top with the flutter sleeves is the perfect touch! Look at you! 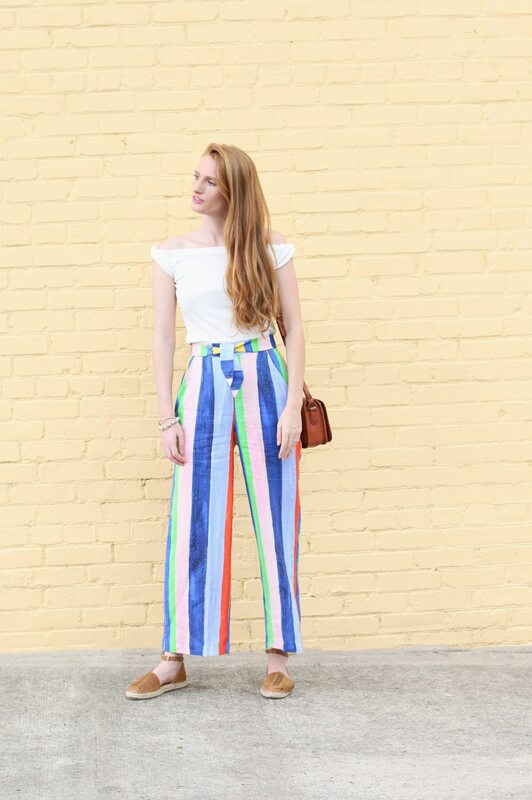 you look so awesome in your fave colored pants! seriously though that bottom of yours is so so legit! Those pants are so fun! I wish I had a pair for my trip to New Orleans! Wow! These pants are amazing!!! Super fun and they fit you so well. Oh the fun and silly adventures you can have in them. Bermuda would be a great place to show them off. ! Those pants are so much fun. Love how you styled it. Beautiful pictures. Ahh I love how fun these pants are!! Those are so fun!! I am loving this colorful print of hers! I am loving this colorful print of hers! So fun! These pants are SO CUTE! I want to wear them all summer long! Wow these pants are so adorable!!! You look amazing in them. Color makes everything better! I am in love with these pants! So fun and colorful! Okay, need these pants in my life! LOVE the vibrant colors! These pants make me so happy! They look soooo comfy & I would totally take them to the beach with me.